Would you like to give your pupils more opportunities to speak to each other in English? Are you looking for fun activities you know they will enjoy? Do you need materials that are easy to use and quick to prepare? Then Primary Communication Box is just what you need. 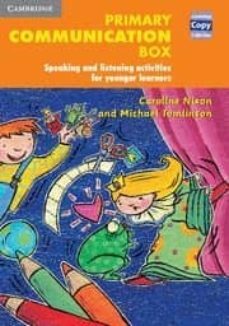 It contains over 50 photocopiable speaking activities designed to encourage real communication in the primary classroom. * Lots of different activity types including information gaps, role plays, class surveys and open discussions mean your lessons are varied. * Activities based on realistic speaking situations so that pupils can cope in the real world. * Pupils are encouraged to work in pairs, small groups and with the whole class to share ideas and opinions in meaningful contexts. * Many of the activities are suitable for learners preparing for the Cambridge Young Learners English Tests. * Clear step-by-step teaching notes make preparation easy.